DVD Ripper for Mac is perfectly compatible with your Mac OS. You can rip DVD to AVI, MPEG, WMV, DivX, MP4, H.264/AVC, RM, MOV, and 3GP video formats. Moreover, you can extract audio files (formats like MP3, WAV, WMA, RA, M4A, AAC, AC3, OGG, and AU) and images from DVD movies. 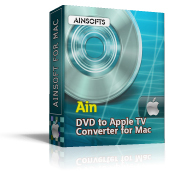 More important, you don’t need to find other special converters for your Apple TV, iPod, iPad, iPhone, PSP, PS3, this awesome DVD Ripper for Mac can help you solve all the problems. It will help you convert DVD movies to PMP(Portable Media Player) movie formats like iPod, PSP, Zune and Archos, etc. 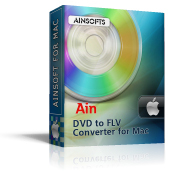 DVD Creator for Mac is specially designed for Mac users to convert AVI and WMV files to DVD with excellent output quality and highest conversion speed. Other file formats such as MPEG and DivX are also supported. Except creating DVD movies, DVD Creator for Mac can also burn DVD movies to DVD folder and ISO files. You can also preview the video before converting. DVD Copy for Mac is a nice assistant for Mac users to back up DVD movies or files. It will help you copy your DVD movies (formats such as DVD-5 and DVD-9) at a ratio of 1:1(such as DVD-5 to DVD-5, DVD-9 to DVD-9). You can copy the DVD to a new DVD disc, or save them as a DVD folder or even an ISO file. You can also compress and copy DVD-9 to DVD-5 completely with excellent quality. It is ok to copy the DVD to your hard disc if you don’t have a blank disc at the moment. This powerful and easy-to-use DVD to Apple TV Converter for Mac is a professional program for Mac users to convert DVD to Apple TV format file such as Apple TV MPEG-4 and Apple TV H.264. Otherwise it can convert DVD ISO to Apple TV MP4, H.264 videos. It has other advanced functions to make it your best assistant to convert DVD to Apple TV such as preview the movie, customize output file effect, and convert files in batches. As we know, AVI is one of the most popular video formats, what if you have a DVD and want to convert it to AVI? DVD to AVI Converter is the right program to help you solve the problem. It will convert DVD (such as DVD-5, DVD-9 and IFO image) files to AVI format like AVI-H264, AVI-MPEG-4, AVI-MPEG, AVI-WMV, AVI-DivX, AVI-XviD. You can preview movies with this program. So benefit from this preview function, we can also use the program as a video player. Using snapshot you can get your favorite stills from movies when you preview them. With a simple and easy operation interface, DVD to FLV Converter is a pretty good assistant for you to convert DVD to Flash Video format (FLV). It cannot only help you capture images when you are previewing, the smaller output FLV file that still keep excellent sound and image quality will be very convenience for you to store. Furthermore. This DVD to FLV Converter can cut DVD movie into 3GP video format segments so that you can put the output file on YouTube. 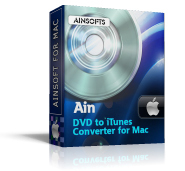 DVD to iTunes Converter for Mac is specially designed for Mac users. It is perfectly compatible with Mac OS. You can convert DVD movies to iTunes video on Mac OS X. It will help you convert DVD to video formats like iTunes MP4, M4V, MOV and audio formats like MP3, M4A, WAV, AIFF which supported by iTunes (including iTunes 9). Moreover, DVD to iTunes Converter for Mac enables you to preview movies before converting, customize output file effect, convert any segment of the DVD movie and so on. Easy-to-use but powerful DVD to iPad Converter will help you convert DVD to iPad MPEG-4 (.mp4) and iPad audio (.MP3) formats. With this DVD to iPad Converter you can clip any movie segments from DVD, and no matter the whole converted movie or movie clips, the sound and image quality are as excellent as original movie. And you can enjoy your DVD movies on iPad anytime. Want digital life wander your fingertips? 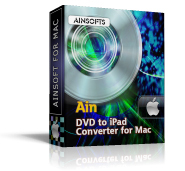 Then get help from DVD to iPhone Converter for Mac. It is an easy-to-use but powerful DVD to iPhone Converter software and can convert DVD movies to iPhone, iPhone 3G, iPhone 3G S Video Formats (including MP4, M0V files) and iPhone format’s audio file such as MP3 and M4A (MPEG-4 audio). It is easier for you to convert DVD to MP3, WMA, AAC, AC3, OGG, MP2, M4A, etc. with DVD to MP3 Converter for Mac. Except previewing movies before converting, you can also convert one or some of the chapters that displayed in the list after adding DVD files. Customize video and audio quality, video size and audio channel will get you a more ideal conversion result. DVD to MP4 Converter for Mac is designed especially for Mac users to enjoy their DVD movies on MP4 players. You can completely convert DVD (including DVD-9, DVD-5, IFO image files) to MPEG-4 and MP4 AVC with excellent output quality and highest conversion speed. DVD to MOV Converter for Mac is turned up to be a converter with much value that can convert DVD to QuickTime MOV videos. 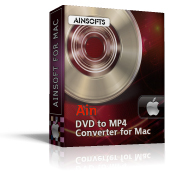 It is the best assistant for Mac users to convert DVD to many other MOV format file with excellent output quality and highest conversion speed. Moreover, it can convert DVD to HD MOV video formats on Mac OS.